The third way in 'rich-media' posting - this can link with facebook and twitter accounts. 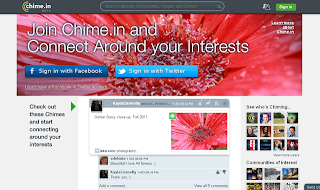 Currently trying it out (chime.in beta) tentatively after an automated email from Mixx. Naturally there's a mobile app and you can edit your profile, etc. Kind of like twitter UI but nicer looking. Not sure where it will fit alongside linkedin, google+, facebook and twitter but maybe it offers something more holistic. Claim your usernames now before they get taken!